It was another first for the Indian Americans in Pittsburgh. The Indian Community celebrated an important day for India, second only to its Independence Day. It was India’s Republic Day, on January 26, 2019 at the Indian Community Center in Carnegie. 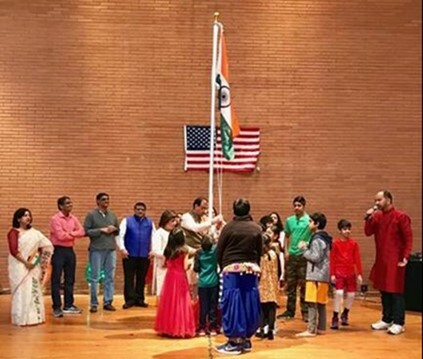 Thanks to efforts of Chetan Patel (President of United Seniors Association of Pittsburgh) Krishna Sharma (Indian Community Center), the event drawing over 150 Indians of all ages in the ceremonies with the unfurling of the Indian Tricolor, went off well. There was singing of the Indian and American national anthems, other songs, speeches and dances. India gained its independence from the British colonial rule on August 15, 1947. However, India was still governed by a Britain-appointed governor-general, because the country did not yet have its own permanent constitution. It took the 308-member drafting committee of the 308-member Constituent Assembly more than two years and hundreds of public debates before adopting the permanent constitution. The Constitution of India came into effect on 26 January 1950, marking the first Republic Day of India, with the indirectly elected president of India as the constitutional head of state. Dr. Rajendra Prasad was the first President of India. While the flag of India is ceremoniously hoisted up the pole from below to commemorate gaining of independence, the flag is unfurled from the top in the annual Indian Republic Day celebrations. This entry was posted on April 7, 2019, 6:18 pm and is filed under Current Issue. You can follow any responses to this entry through RSS 2.0. You can skip to the end and leave a response. Pinging is currently not allowed.